I love the woodgrain pattern! 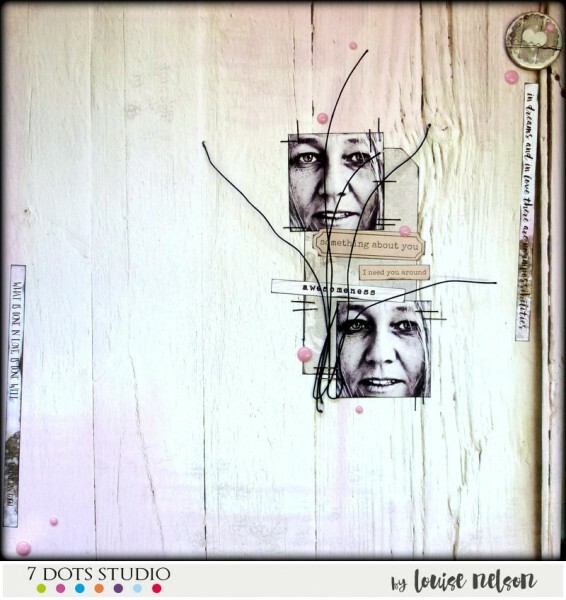 And there’s so many different ones in 7 Dots Studio collections right now. 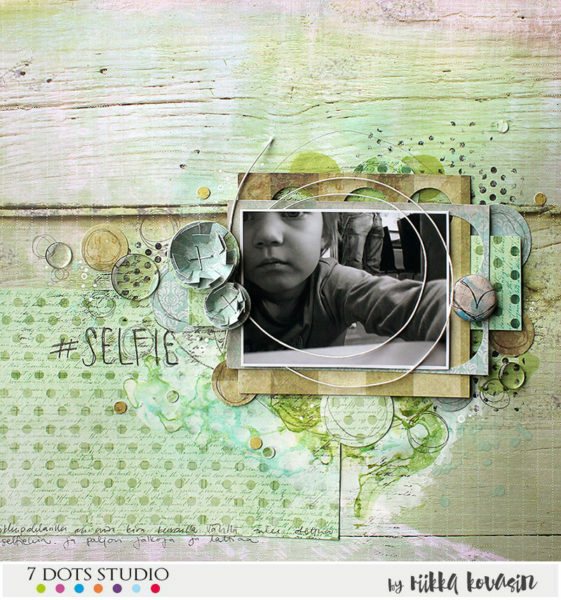 I chose to go with this white / mint green one from the Verano Azul collection and documented my younger girl’s selfie in the page. She’s really enthusiastic photographer and while most of the shots are from the floor or hazy details of toys, some of the photos are real gems like this one. I love how she has captured herself in the photo! 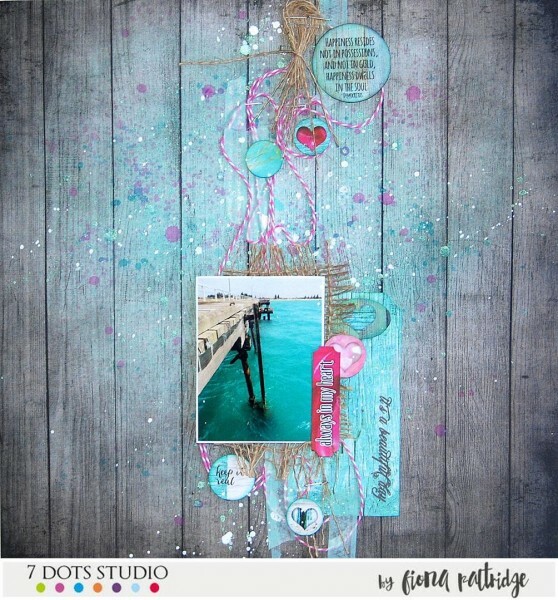 Wooden bench, wooden layers, wooden background. Wood is everywhere! Enjoy! 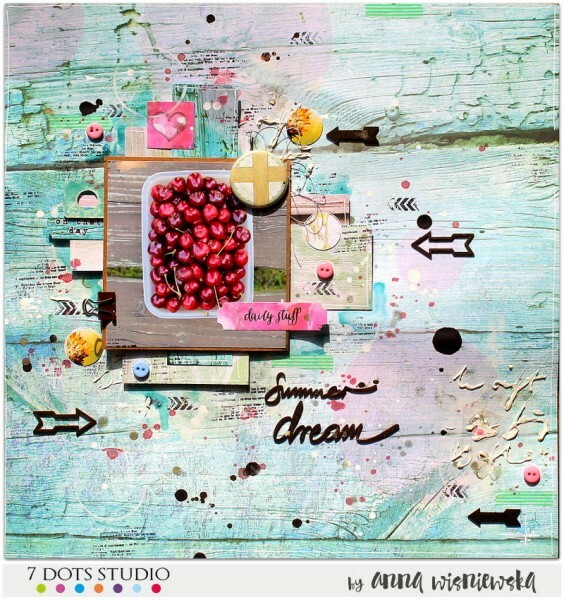 To create my layout I used wooden sheets of paper from Verano Azul collection. “Love is all you need” is what I titled this picture piece of my neice, with her Dad, my brother-in-law. I made this as a “thank you” gift for her, having had my daughter to stay for the last couple of months, in the UK. 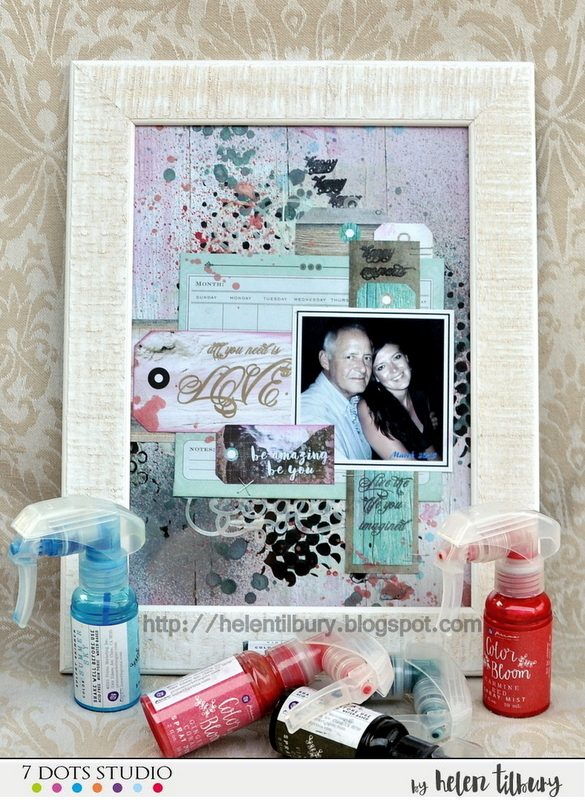 Putting things under glass is a great idea for gifts as it protects your work forever & makes it display easy. 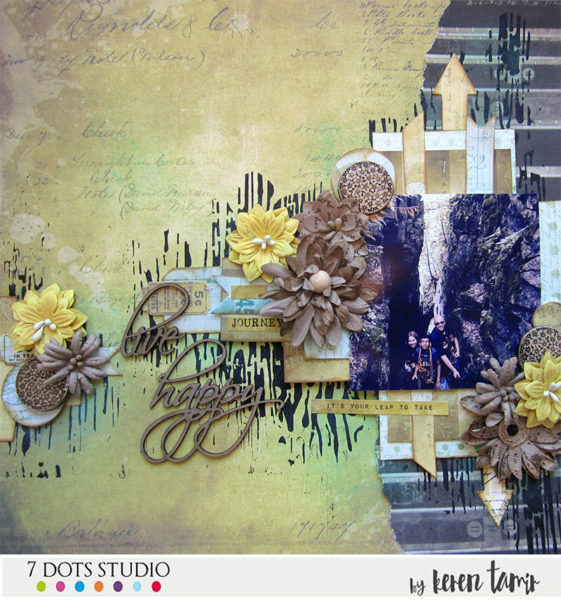 I used the woodgrain paper from the Verano Azul Collection as my base paper & layered up some tags around it. 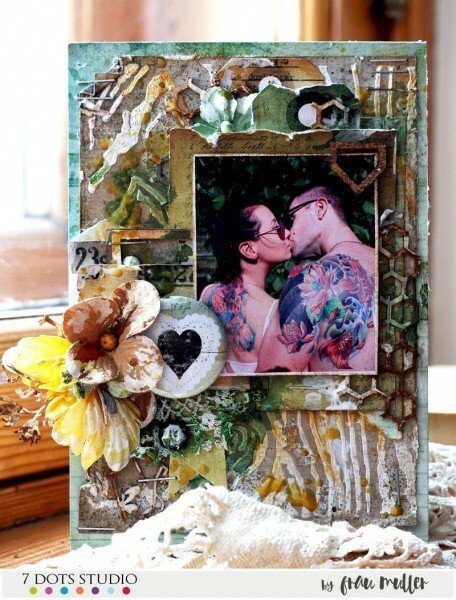 As I needed to keep everything flat, to fit under the glass, I used mists, paints, inks & stamps, instead of embellishments, to add some ‘pop’! I decided to make a Refrigerator magnet for my cousin and his wife. They are very beautiful couple. I’ve made wood texture on background paper and added different elements with fall mood. 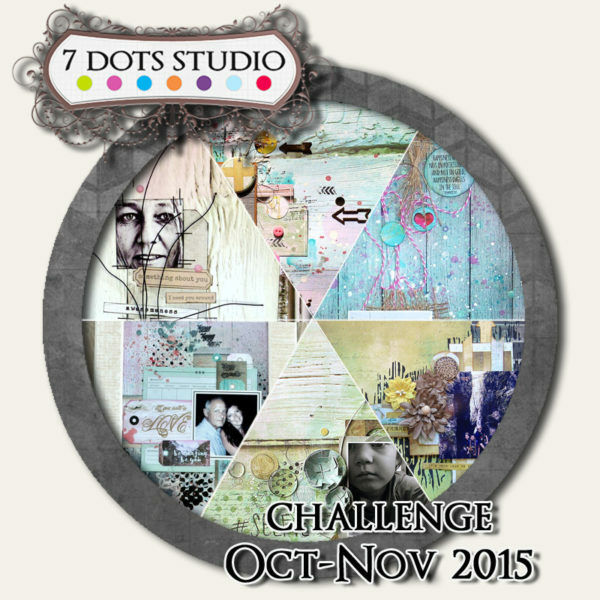 This was a very fun challenge to do as I love using wood grain patterns in my projects. There were so many ways to interpret this theme and 7 Dost Studios conveniently has many collection papers with a wood grain pattern on them. However I chose to use a wood grain stencil to create this pattern in the background to match the natural feel of the photo. 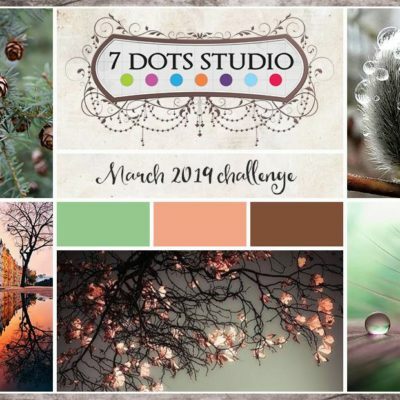 With this month’s challenge Louise is using the beautiful Verano Azul range to create a layout to document her friendship with her wonderful creative friend Lisa. We announce winners by the end of the November. One lucky person will win Collection Kit and 6×6 pad!!! We will randomly choose also one person, who will receive 10EUR coupon to our store.